If Autistic people were accepted we would not need Autism Awareness Month. Yes. That is what I said. We live in a society that does not value diversity. We live in a society that disables people with its intolerance of difference. We live in a society that honestly believes the best thing to do for an Autistic child is to make them look not Autistic so that they do not get teased or bullied. Conform. Fit in. Submit. Perform. These are the messages my children receive day after day. One month of awareness talk is not going to change that. In fact, it reinforces it. "We are aware you are here and you are different, and we see you as a burden to be endured, problem to be dealt with and a puzzle to be solved." That is the message Autism Awareness Month sends to Autistic people. If our society valued diversity Autistic people would not be seen as a burden. 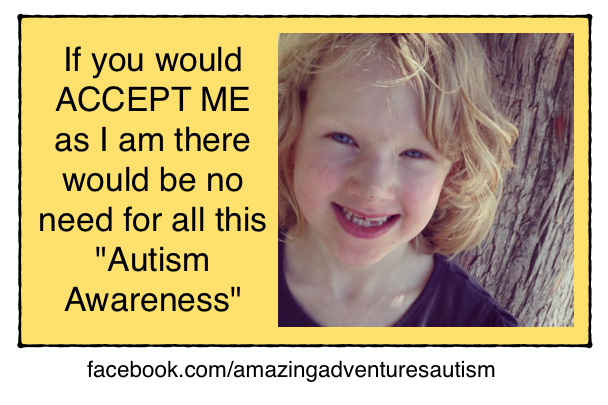 If our society encouraged and celebrated difference Autistic people would not be treated like a problem. If our society would condemn bullying instead of encouraging the disabling of people in minority groups more people would be willing to speak against the rhetoric of puzzle pieces and mystery. The tricky part of this conversation is that there are people who really do believe that awareness helps. They have very good intentions. They want to do what is right. I can understand why they feel defensive when they first hear someone say that awareness is neither helpful or enough. To be honest, I did a bit of a double take the first time I saw the idea too. My response was to read the dictionary! I love words.... and am always interested in defining and understanding (call it a special interest, if you will). Reading the definitions of awareness and acceptance showed me clearly why awareness is not helping Autistic people. Autistic people are here with us in our shared society. They are offering themselves unreservedly and in all their diversity and beauty. They are asking us to look at them and receive them as adequate, valid and suitable, and that we do that without condition or expectation that they will change to suit our whims. It is not a big thing they are asking. Just acceptance. Just exactly what you and I are privileged to receive already. And I say yes. I am not happy to merely have knowledge of this situation. I choose to accept what I am being offered. It is after all a gift when someone offers themselves to you. They are making themselves vulnerable and open to hurt. So far our society has dished out a lot of hurt to Autistic people. I say yes. I choose acceptance. 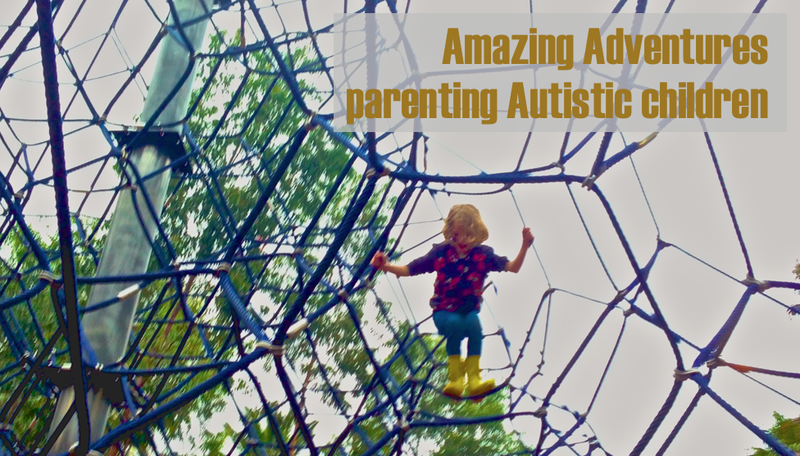 And I say to my Autistic children: You are adequate. You are valuable. You are suitable. You are wonderful just as you are. I love you. I do say yes. I choose acceptance. And I say to my Autistic friends: You are adequate. You are valuable. You are suitable. You are wonderful just as you are. I am glad you are here. And I say again, If Autistic people were accepted we would not need Autism Awareness Month. Will you celebrate Autism Acceptance Month with me? image: a yellow rectangle with a black line border. On the right of the rectangle is a photo of a fair skinned, blond haired and blue eyed child in front of a tree trunk. If you would ACCEPT ME as I am there would be no need for all this "Autism Awareness"